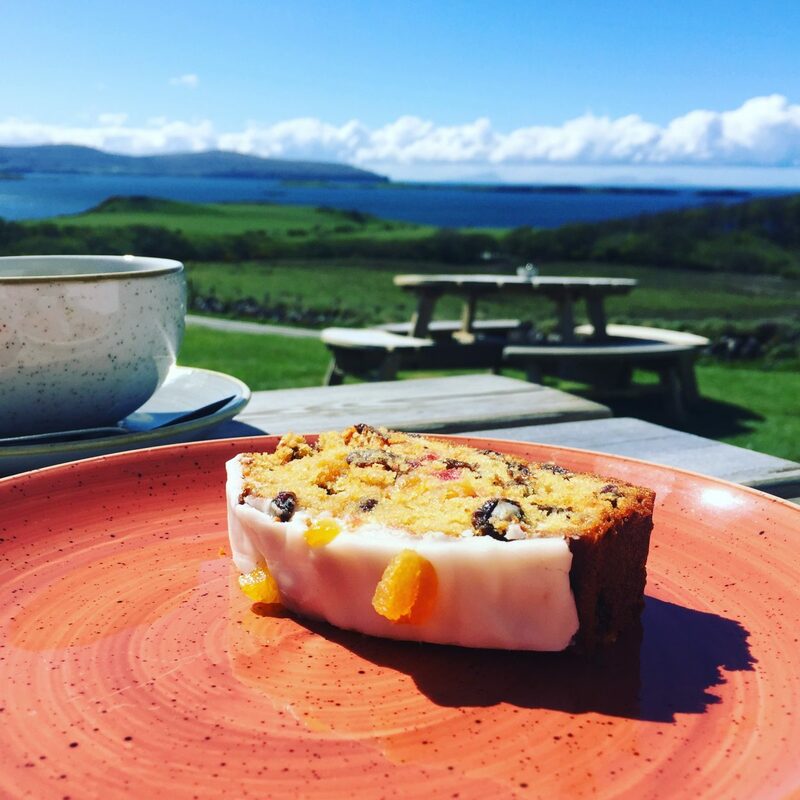 Skye – A foodies paradise. 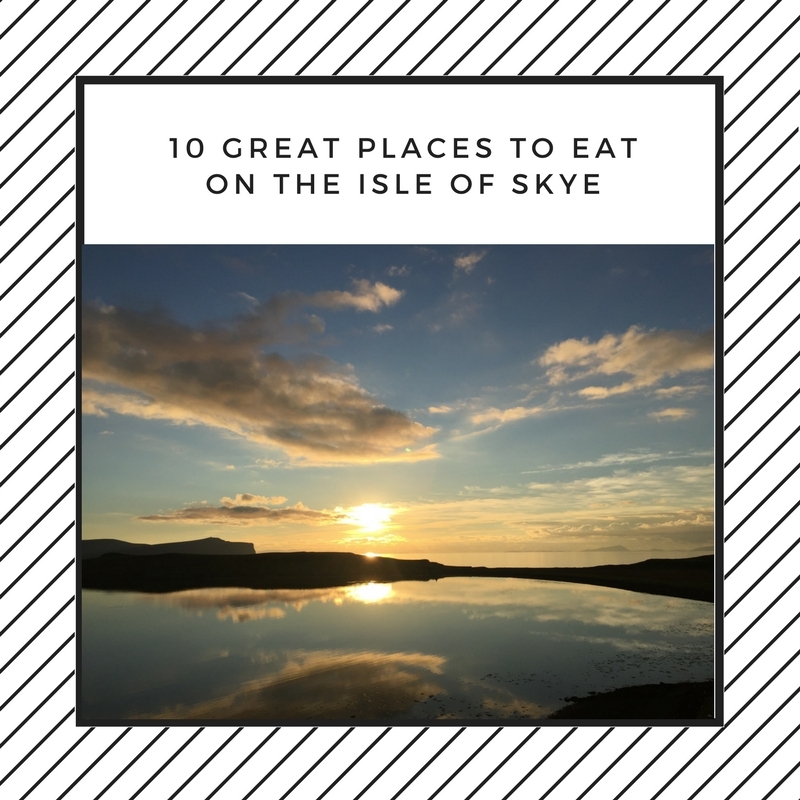 If you love good food and you’re planning a visit to Skye then you’re in for a real treat as the island has lots of great places to eat. 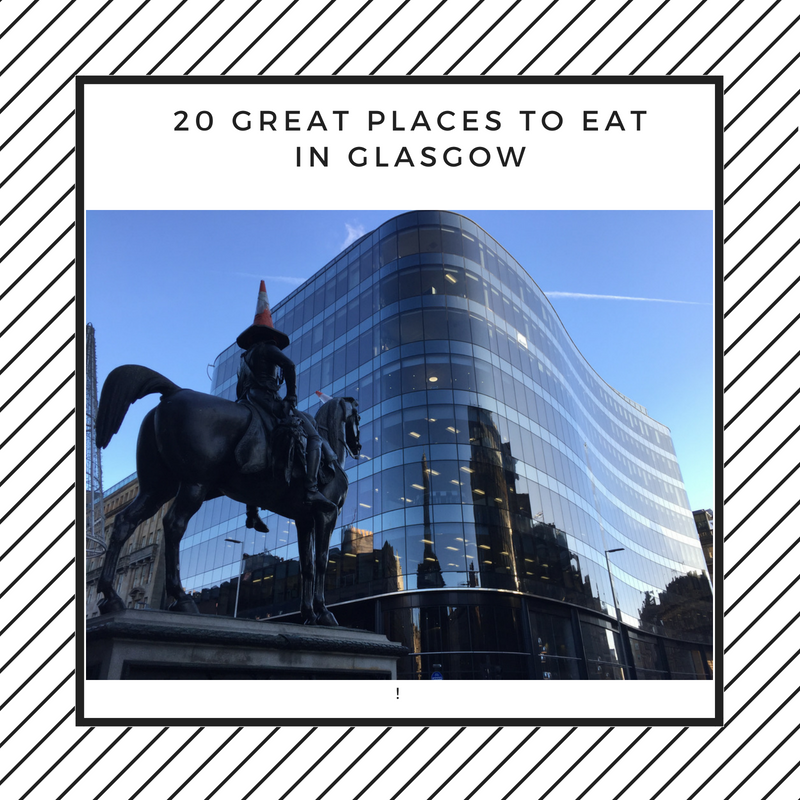 To help get the most from your visit we have pulled together our favourite restaurants and eateries for you to try. We haven’t ranked the list as we love them all and which one you choose really depends on the type of meal you fancy. 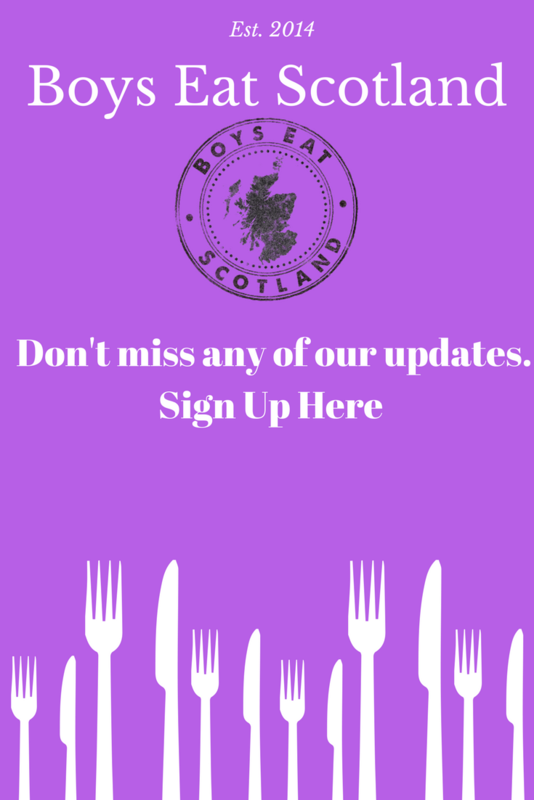 We recommend visiting each restaurant’s website (just click on the links) and have a look at the menu and opening hours before you visit. 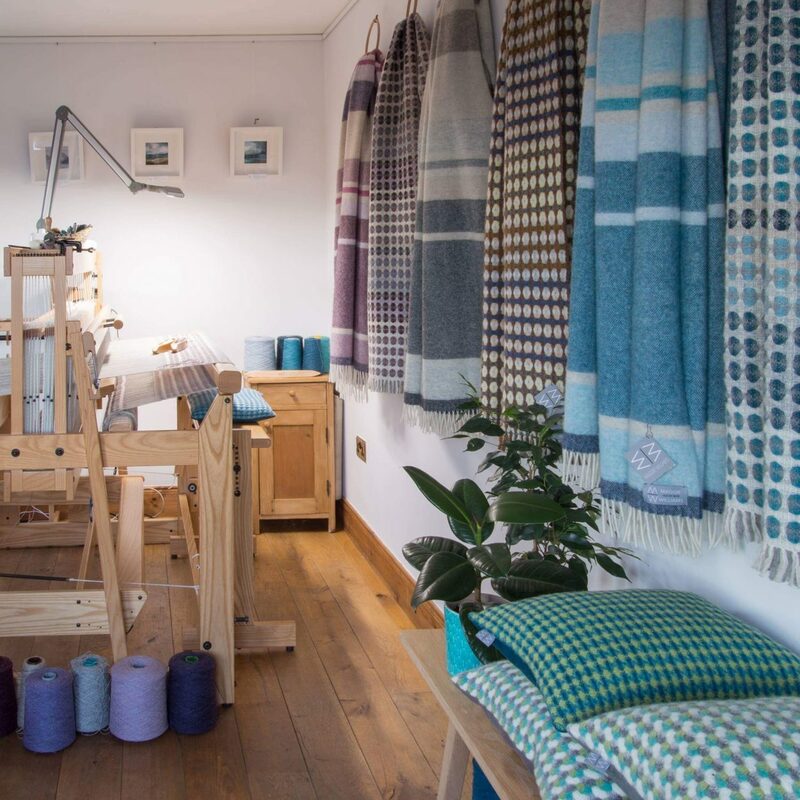 Situated on the stunning north east coast overlooking the picturesque Loch Mealt and the dramatic Trotternish Ridge, is the small hand weaving studio and gallery of Maggie Williams. The gallery also has a tea room serving amazing cakes, soups, tea and coffee. Why not have a bash at weaving whilst you’re there! Raymond and I visited Kinloch Lodge on a cold December day for Afternoon Tea and enjoyed a super couple of hours sitting beside their roaring fire drinking tea and eating sandwiches, homemade scones and cakes. 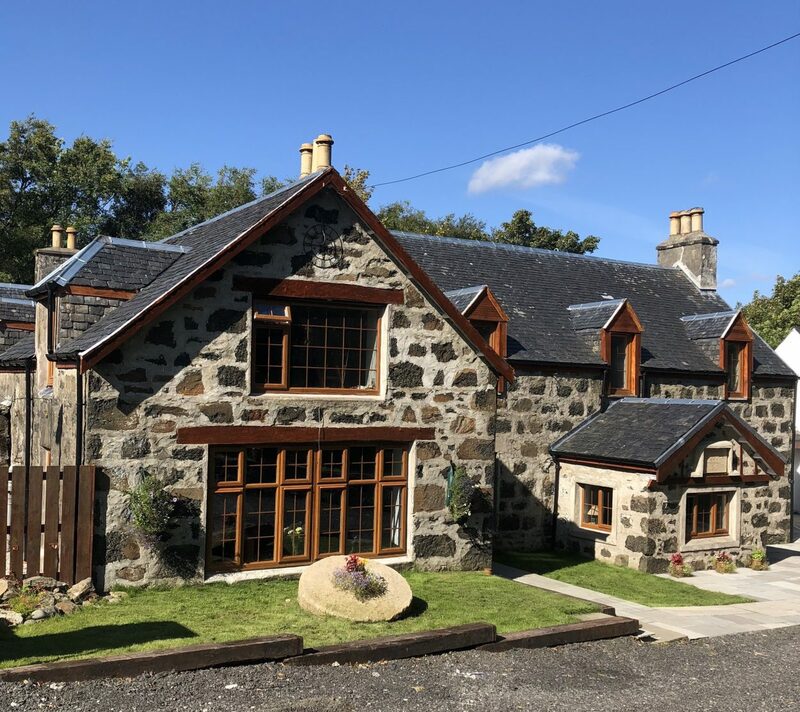 Situated down a single track road at the head of Loch na Dal on the Sound of Sleat, Kinloch Lodge, the ancestral home of Lord and Lady MacDonald doesn’t disappoint – the food and views are amazing. Marcello Tully presides over the award winning restaurant. 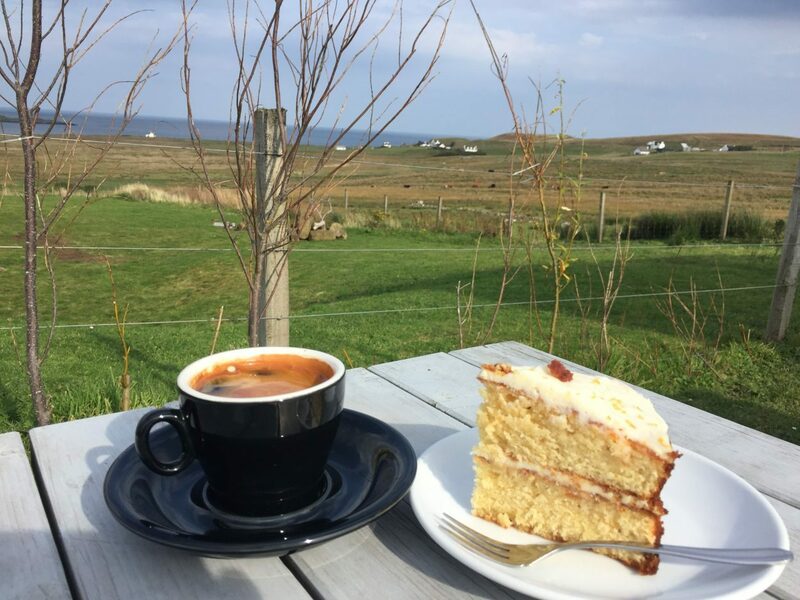 Barry and Liza set up Isle of Skye Baking Company ten years ago, and the business has gone from strength to strength. Their shop in Portree has a fresh selection of bread and cakes daily and also stocks their wide range of preserves, oatcakes and biscuits. This is usually our first stop for good bread and homemade jam for holiday cottage breakfasts! 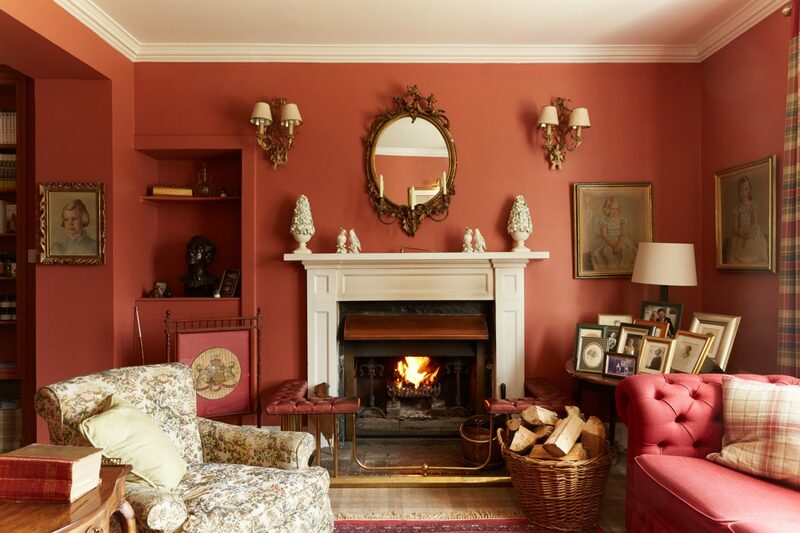 The wood burning stove also makes this a cosy place to stop for coffee and cake or a bite of lunch. Upstairs they also have the Skyeworks gallery offering an excellent range of Scottish products. We splashed out on our last visit and bought one of their Darach whisky barrel benches. 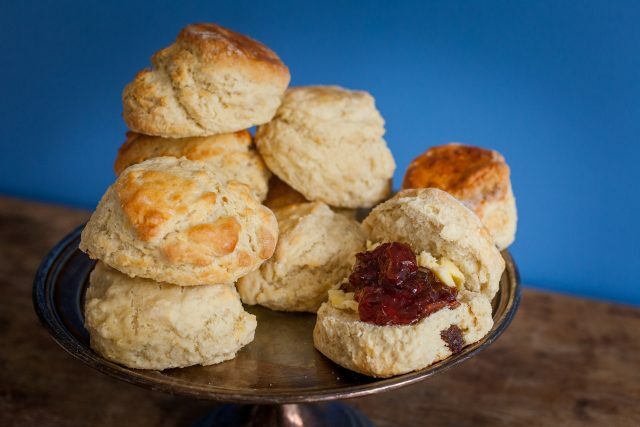 There’s lots of temptation both upstairs and downstairs at Isle of Skye Baking Company. 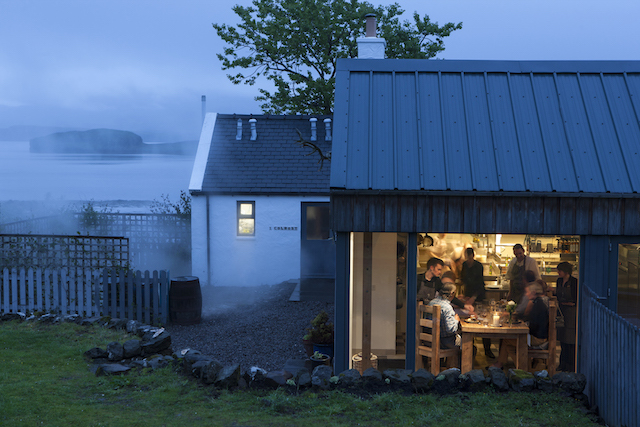 The Three Chimneys has always been one of our favourite restaurants on Skye. We’ve been for lunch and dinner six times in total. Our last visit was in May 2018 and we enjoyed an excellent birthday meal. Over the past three decades, the restaurant has been regarded as one of the best places to eat in the world and has continually maintained fantastic international acclaim and 3 AA Rosettes. 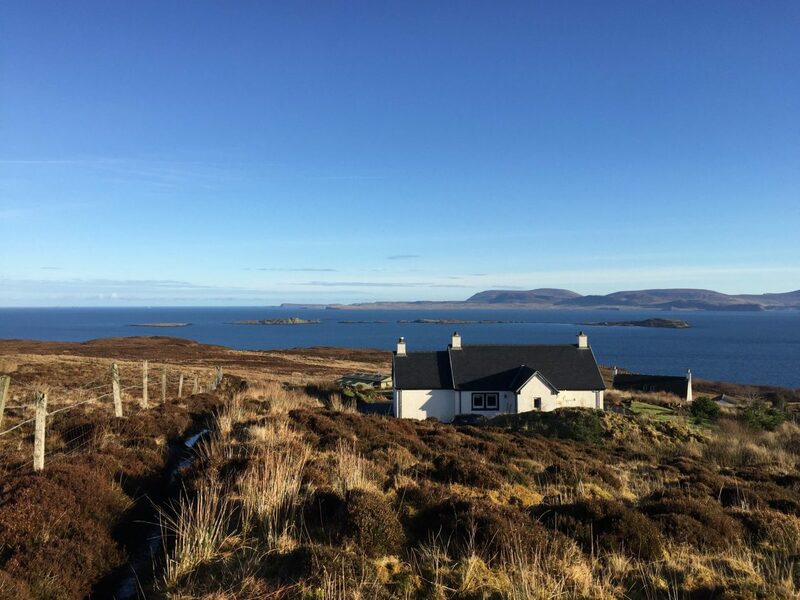 The Three Chimneys has just been awarded Best Restaurant in the UK 2018 by The Good Food Guide. 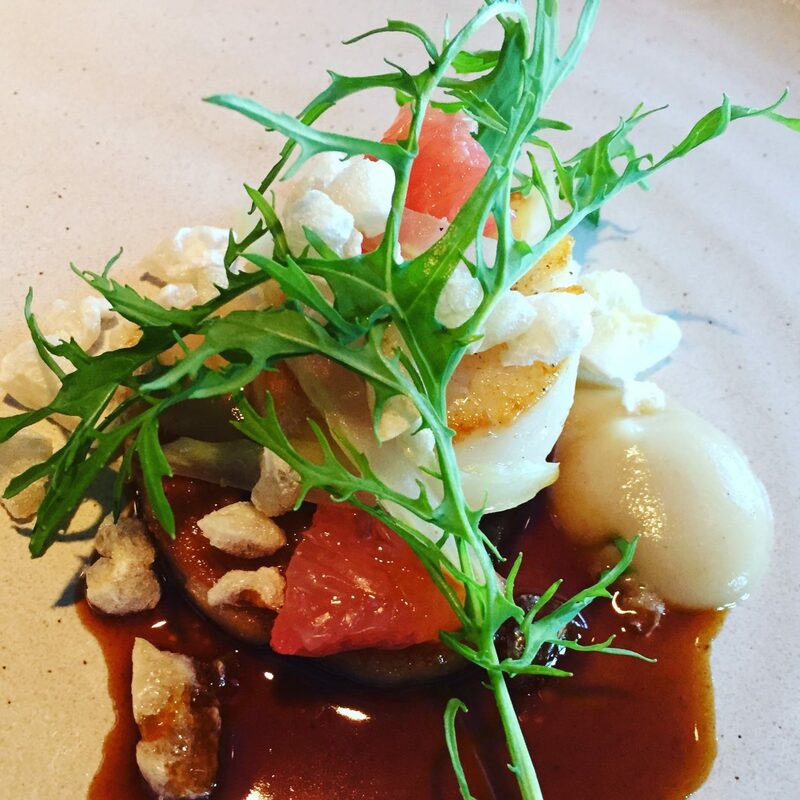 Scott’s menu reflects the incredible variety of food from the island’s natural larder, and when you dine at the restaurant, you enjoy the very best of Skye. The last time we visited we watched the shellfish for dinner being delivered straight from the loch. The restaurant may have been around for three decades, but Shirley, Scott and the team have such passion that this is a restaurant to watch over the next few years. Exciting times ahead at The Three Chimneys! A visit to Skye isn’t complete without popping in to see the Skye Oyster Man in his Oyster Shed! If you’re looking for a no fuss lunch of excellent seafood in rustic surroundings, then this is the place to go. Don’t expect anything fancy – just great seafood and local produce. Stand around the whisky barrels or at the trestle tables and enjoy your taste of Skye looking out over the beautiful countryside. We stayed in a holiday cottage and were looking for some Venison at New Year and Paul arranged this for us so if you are self-catering and looking for fish or meat, give him a shout. 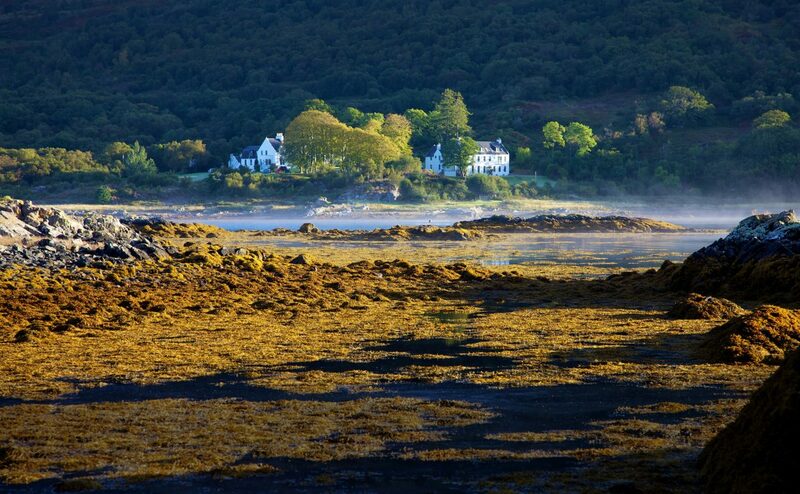 In 2018, The Oyster Shed will also be popping up at The Royal Hotel in Portree with their fresh seafood. 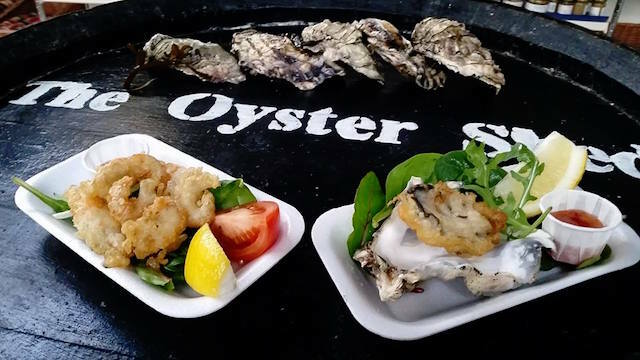 The Oyster Shed is just up the hill from Talisker Distillery so if you are visiting Talisker be sure to pop in. 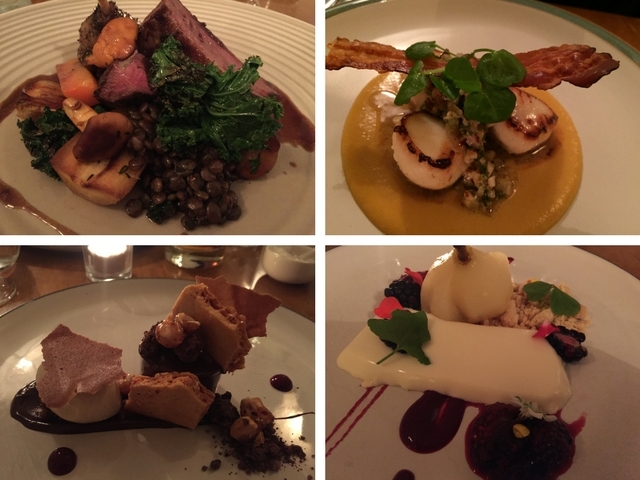 We have enjoyed many excellent meals at Michelin Star, Loch Bay Restaurant while staying at Creagach Cottage. Chef/Patron Michael Smith (previously chef at The Three Chimneys) and his wife Laurence, own the restaurant, and Graeme Creamer oversees warm and friendly service as the restaurant manager. 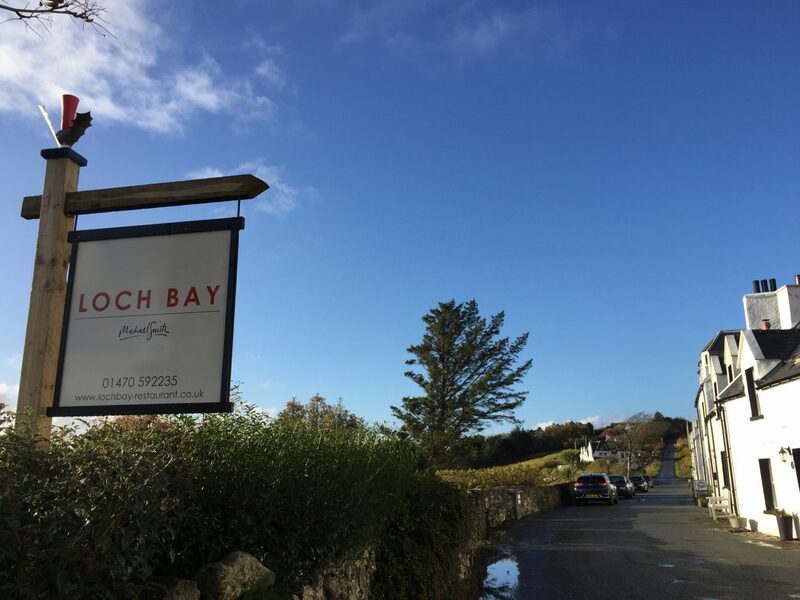 Loch Bay is situated in a whitewashed cottage in the old fishing village of Stein on the Waternish Peninsula and serves both lunch and dinner. 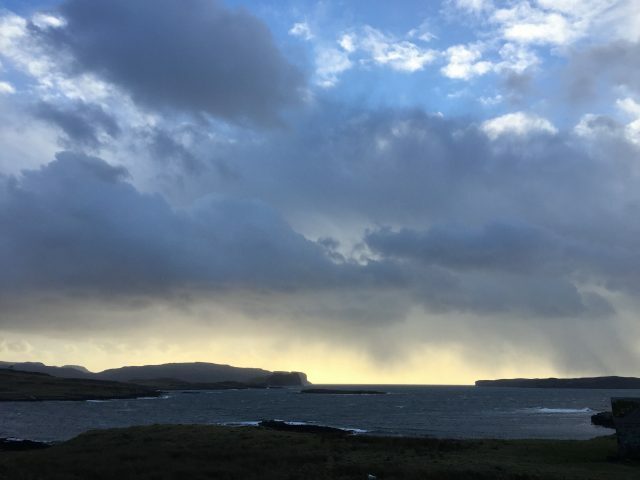 Waternish is one of our favourite areas of Skye and regarded as one of the best places in the world to watch the sunset. Do try to make time to visit Trumpan Church at the end of the road just as the sun is setting – amazing! 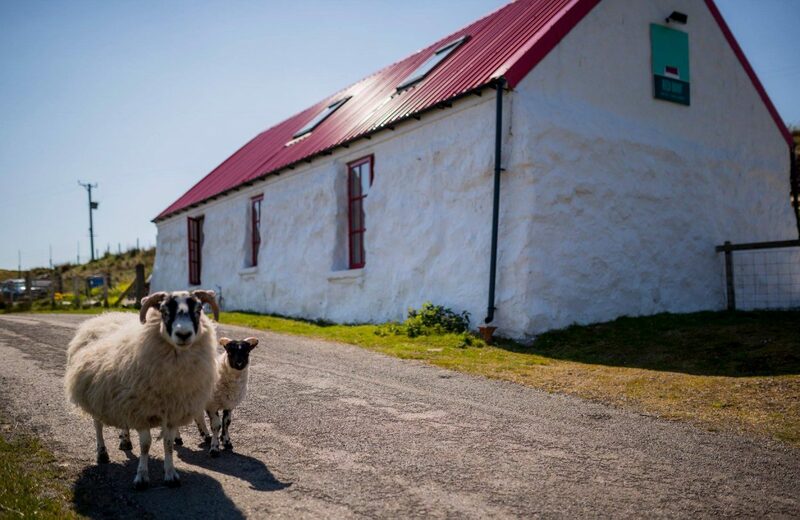 If you have time, be sure to pop into Skyeskyns – worth a visit and don’t forget your credit card! 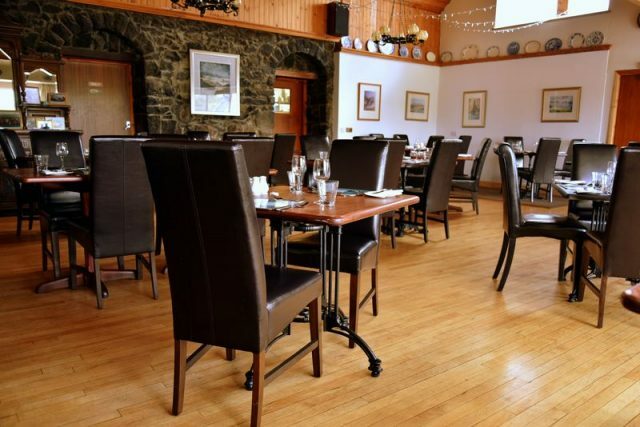 The Old School Restaurant in Dunvegan is popular and we have enjoyed some lovely meals there. 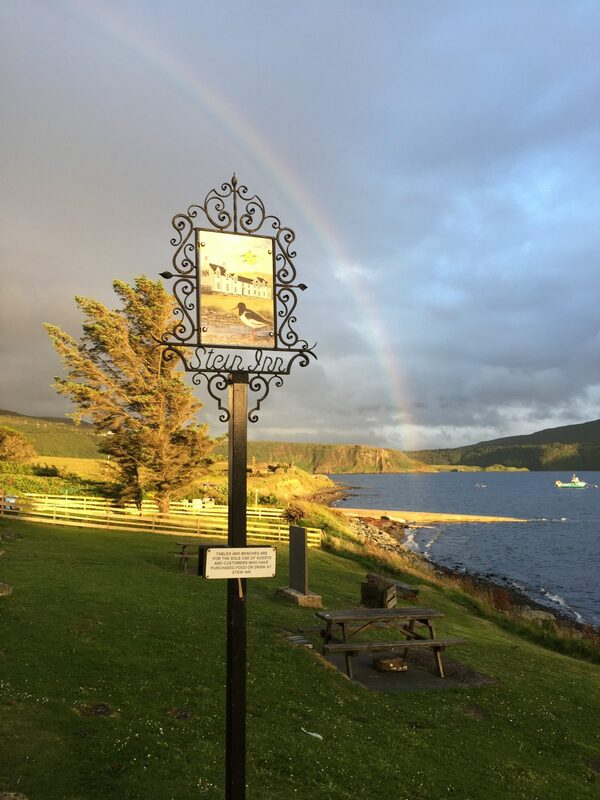 The building used to be Durinish school and became a restaurant back in 1985 when Maryann and Hugh Mackenzie, “original Sgitheanachs” returned home to Skye after a naval career. This lovely cosy restaurant is still in the family and welcomes locals and visitors with friendly service and great local produce. 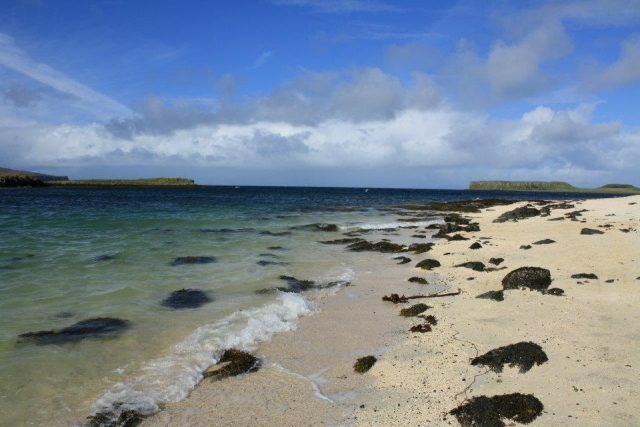 If you have time when you are in Dunvegan, a walk to Coral Beach a few miles outside the village is a must! A walk to Neist Point lighthouse and then dinner at The Red Roof is always a great day out on Skye. 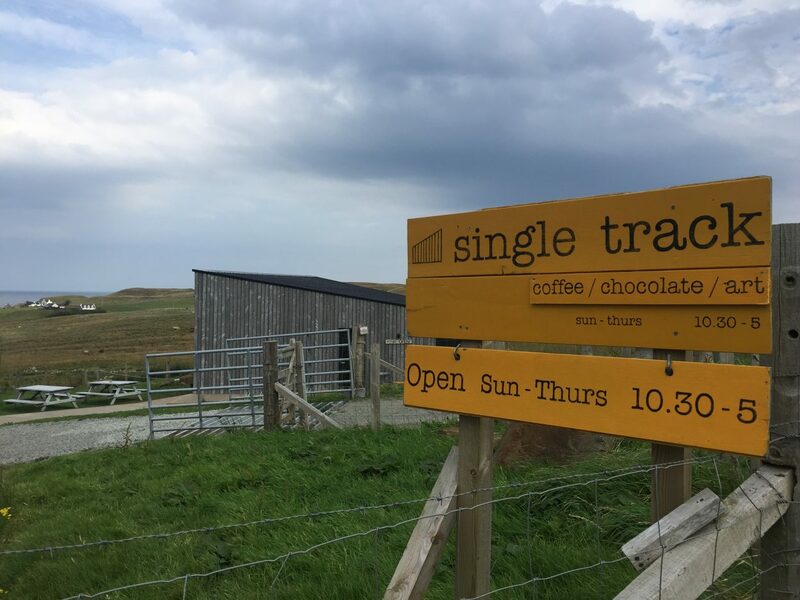 If you are visiting the north end of Skye, then Single Track has excellent coffee, hot chocolate and legendary homemade cakes! They also have a soup available every day. The perfect stopping off point for a tour around the North End of the island. 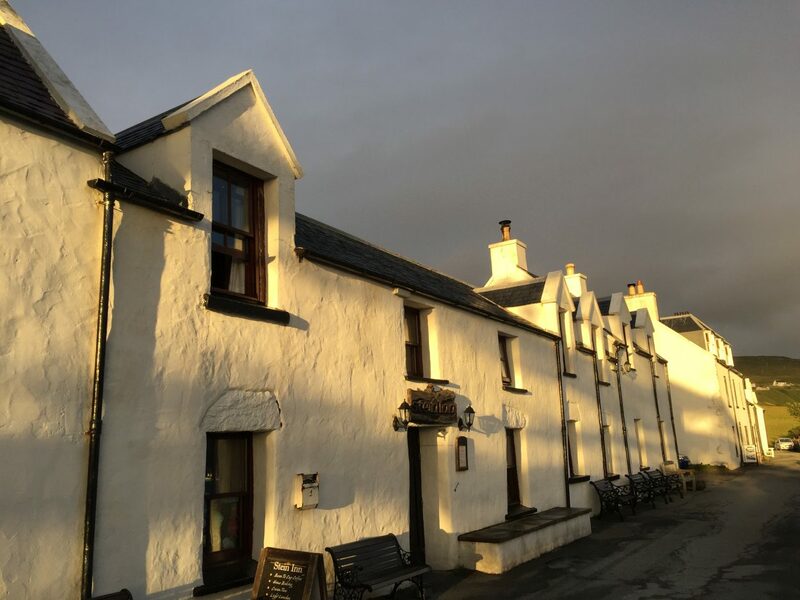 The building dates back to 1543 and was the first place in Skye to be allowed to sell alcohol. Newly refurbished and reopened in 2018, Chef Calum Montgomery has created a beautiful restaurant with rooms (rooms coming soon). 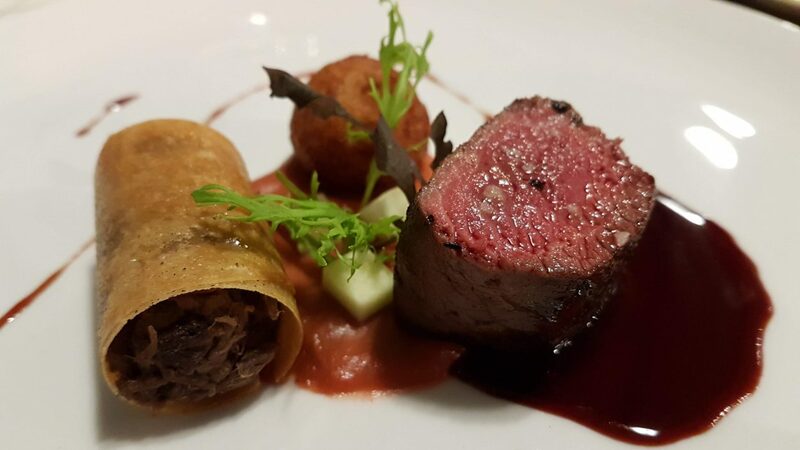 Enjoy a 10-course Taste of Skye Menu. Calum goes out fishing and foraging form the very best ingredients for his menu. We visited in August 2018 and enjoyed a fantastic meal. Highly Recommended. 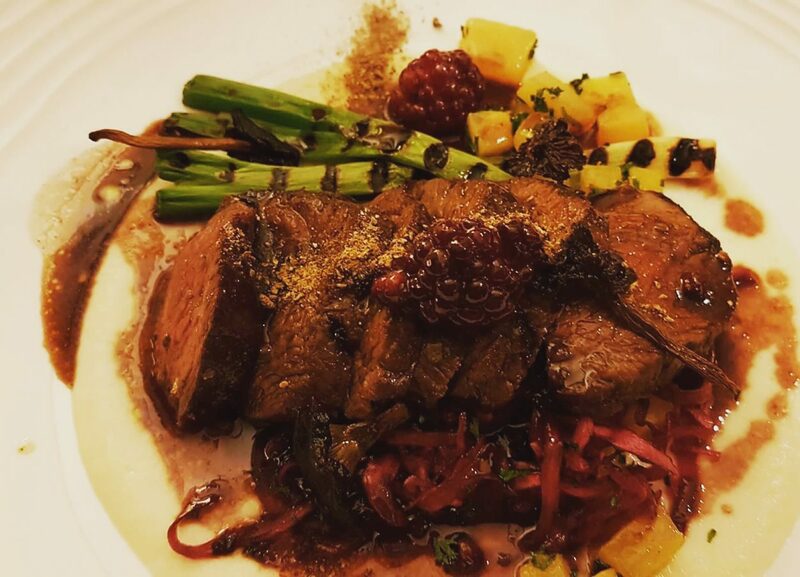 Seaflower Skye isn’t your usual restaurant! 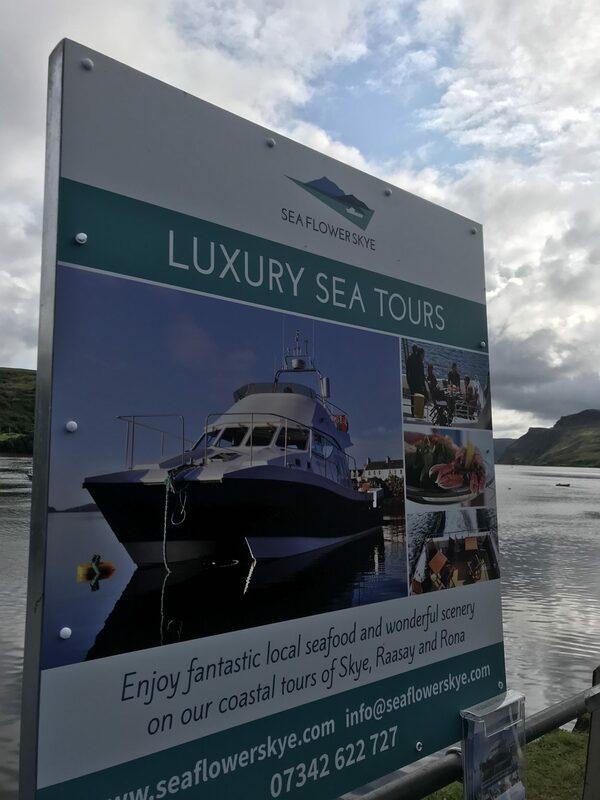 Ewan and Janice run luxury sea trips from Portree to the islands of Rona and Raasay on their fantastic boat – Seaflower Skye. 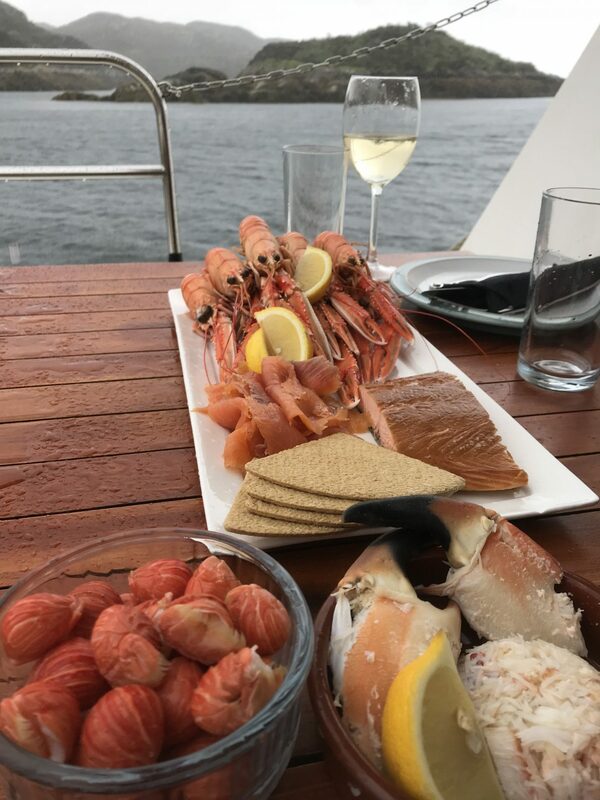 They served the most amazing Scottish Seafood Lunch complete with wine on board the boat. The langoustines are caught by Ewan’s brother who fishes from Portree. We took a tour to Rona in August 2018 and had a wonderful day. Read all about our visit here. 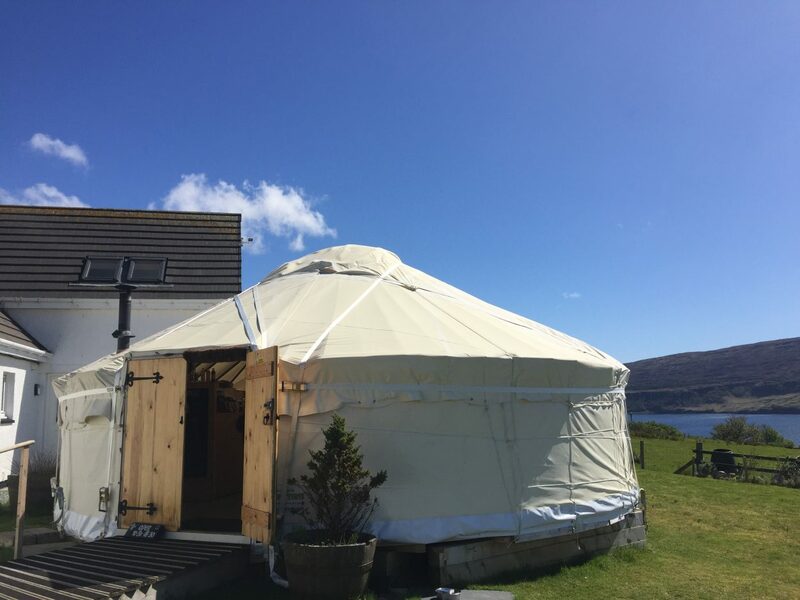 The Yurt pops up each summer outside Skyeskyns with teas, coffee, delicious cakes and the most amazing views. The yurt opening is wind dependent, so check ahead on facebook to make sure they are open! You will probably find yourself passing through Glendale if you are heading to Neist Point Lighthouse. 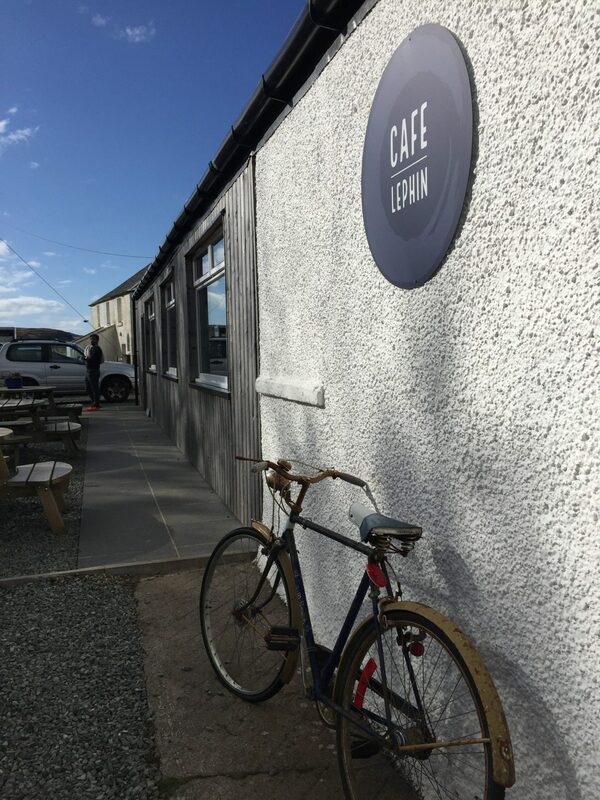 Cafe Lephin is on the way and the perfect stopping off point for coffee, cake or lunch. 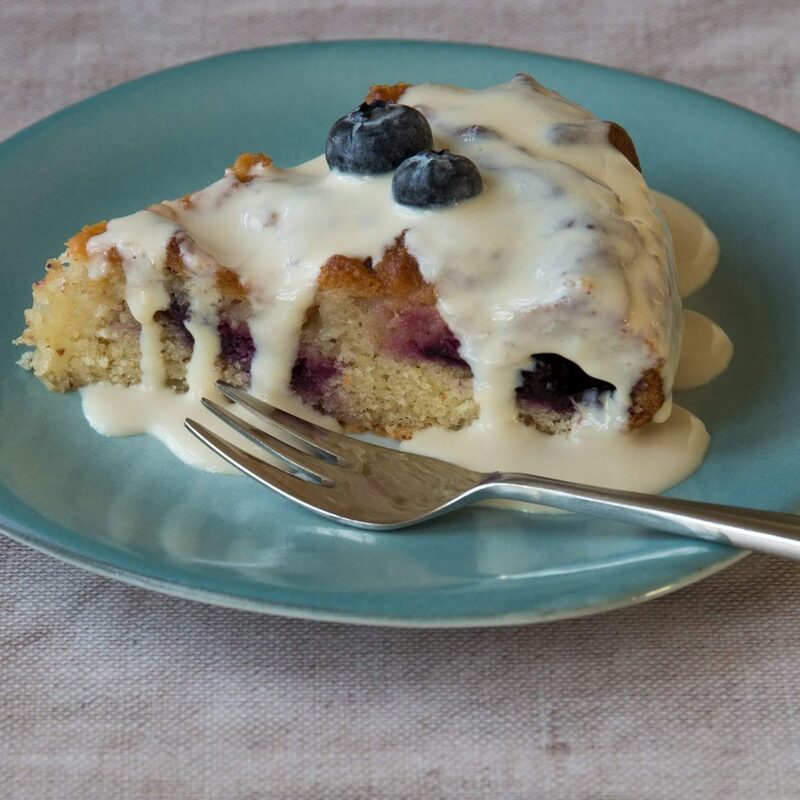 They serve excellent coffee and have a delicious selection of homemade cakes each day. They also have a selection of light lunches available. If the weather’s a bit blustery outside they also have a lovely wood burning stove to keep you warm! 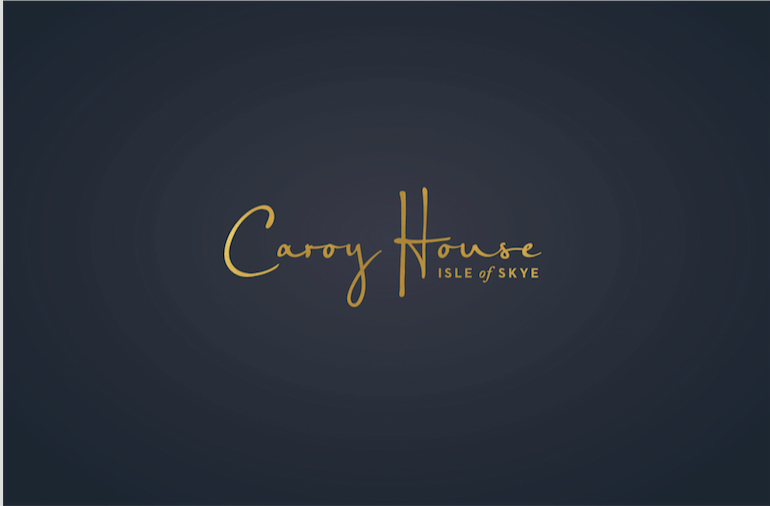 Chef Calum Munro will be launching Caroy House Restaurant and Bar, located in the heart of picturesque Portree this summer. 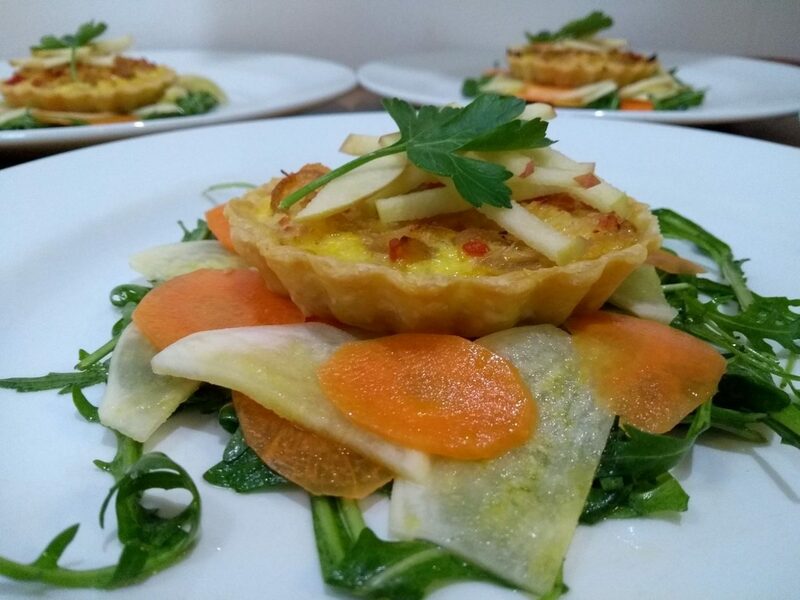 Serving, local, seasonal food from breakfast through to dinner. Rooms will be added next season. 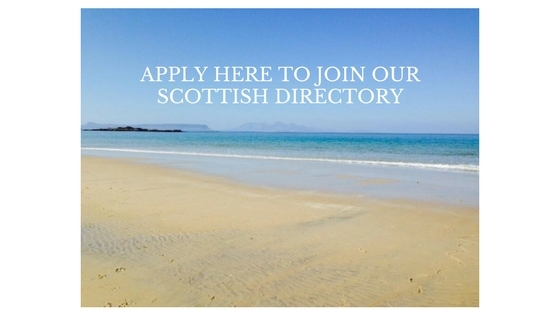 Hopefully, we have given you a good selection of places to visit on your next holiday on the island. We recommend booking ahead for most of the restaurants listed as they do become fully booked over the summer. 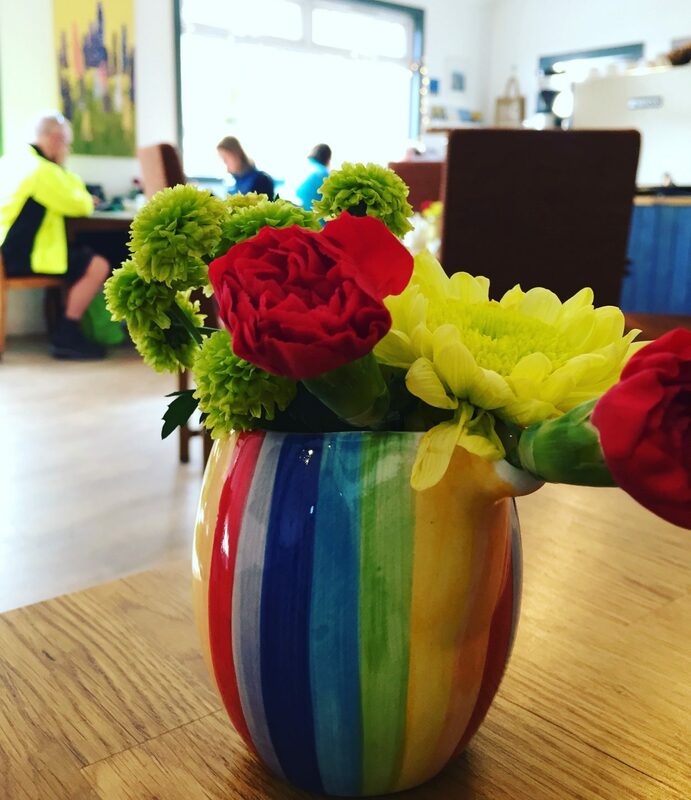 If you have a favourite restaurant or cafe that we’ve missed, please leave a comment below, and we will make sure we pop in on our next visit. Our list has been updated in June 2018. Don’t forget to follow @Boyseatscotland on Twitter, Facebook and Instagram.